Wilson Electronics started making cell phone signal boosters in 1999. We were the first to design, build and supply cell signal boosters to the U.S. and Canadian markets. Over the years we grew, adding new customer-requested signal boosters to our product lines, developing the first ever in-vehicle cell phone boosters and securing more than 50 patents as we developed and refined our technology. The WilsonPro 1050 Inline Amplifier is the industry's first FCC and carrier-approved "inline" cellular amplifier system. It is the only passive distributed antenna system (DAS) with a unique dual-amplifier design to compensate for cell signal that is lost over long lengths of cable, ensuring that businesses have strong cell service throughout their entire building at all times. With the 1050, you can now reach those hard-to-reach places within buildings that previously required additional penetration points to mount the amplifier closer to the needed coverage area. Power: The Pro 1050 is WilsonPro's first two-part amplifier system. It consists of a "main" amplifier and "inline" amplifier. The "inline" amplifier is installed deep inside the building and compensates for long cable runs, up to 300 ft, to the inside antennas. Reliability: The Pro 1050's XDR technology, a Wilson exclusive feature, allows the amplifier to accept virtually any incoming signal strength without overloading and shutting down. This reduces the need for in-field adjustments and delivers higher unit up-time. Best in Class Design: Industry's first FCC and carrier-approved "inline" cellular amplifier system that also provides a self-optimizing design, minimizing installation time. This design includes: single-side cable routing, LCD display, internal power supply and locking cable on the wall mount unit. The WilsonPro 1000 passive distributed antenna system (DAS) is a cellular amplifier designed to provide enhanced in-building cellular coverage for all commercial spaces, including hospitals, hotels, warehouses and offices. 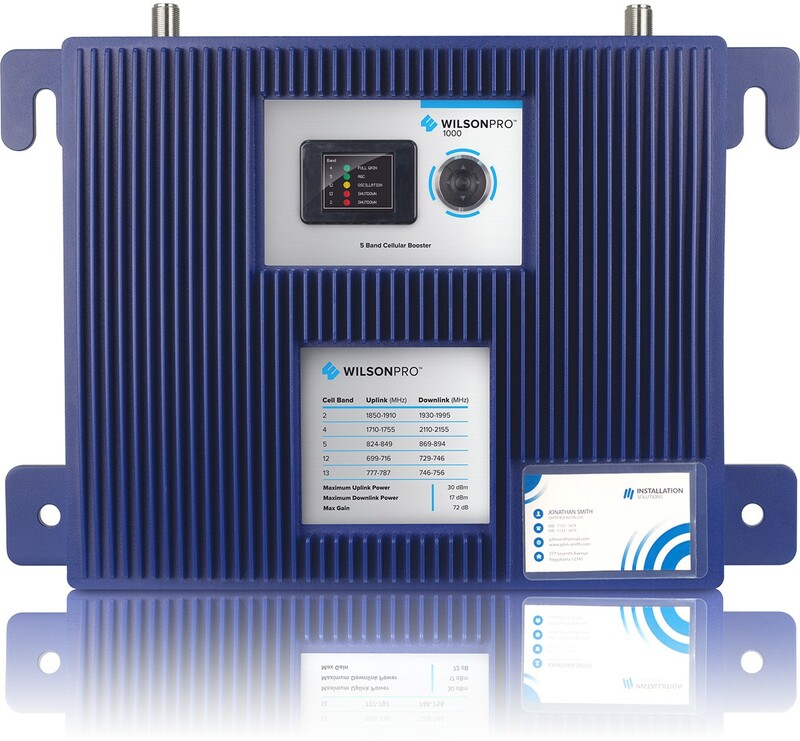 The WilsonPro 1000 amplifies weak cellular signals to provide reliable voice and data coverage - including 4G - to inside spaces where signals may not penetrate, and with new eXtended Dynamic Range (XDR) technology, the amplifier never shuts off due to a strong outside signal or changes in outside signals. Like all WilsonPro cellular amplifiers, the WilsonPro 1000 features cell site protections that auto-detect and prevent any cell tower interference. The WilsonPro 4000R is the first rack mounted, cell booster to incorporate four separate signal amplifiers feeding multiple indoor antennas. Designed to provide enhanced in-building cellular coverage for all commercial spaces, including hospitals, hotels, warehouses and offices, the WilsonPro 4000R amplifies weak cell signals to provide reliable voice and data coverage–including 4G – to inside spaces where signals may not penetrate. Like all WilsonPro cellular signal boosters, the WilsonPro 4000R features cell site protections that auto-detect and prevent any cell tower interference. Learn more. The Wilson Pro brand carries on as the professional line of cell signal boosters, the most powerful, most advanced cell phone signal booster available. The power and flexibility of Wilson Pro boosters make them suitable for virtually any scope of project, whether residential, commercial, security or fleet solutions. Wilson Pro cell phone boosters may include additional components and impose more intensive installation requirements. For that reason the Wilson Pro line is sold exclusively by technology integrators and authorized resellers. Wilson recently launched its main consumer line of cell phone signal boosters – weBoost. weBoost cell phone boosters offer greater power and more options for enhancing signal at home, in the workplace, in a vehicle or even at unmanned remote sites. Patented weBoost technology allows each cell signal booster to automatically adjust to any fluctuation in signal conditions to always provide optimal signal strength. weBoost signal boosters work with any U.S. or Canadian carrier and any cellular enabled device. weBoost boosters are also sold in Malaysia and through much of Latin America. In 2013, Wilson Electronics acquired a competing maker of boosters – zBoost. The zBoost brand continues as an important part of the Wilson Electronics product family, providing excellent value for customers with affordability and ease of installation, and backed by Wilson Electronics’ outstanding customer service. All three brands of cell phone boosters stop dropped calls and lost connections, eliminate no-signal dead zones, extend your connection range, speed your data uploads/downloads, improve audio quality of voice calls in low-signal areas, with the added benefit of longer battery life - up to 2 hours additional talk time on a single charge. Most models boost multiple simultaneous connections across multiple carriers. The WilsonPro 1000 passive distributed antenna system is a cellular amplifier designed to provide enhanced in-building cellular coverage for all commercial spaces, including hospitals, hotels, warehouses and offices. 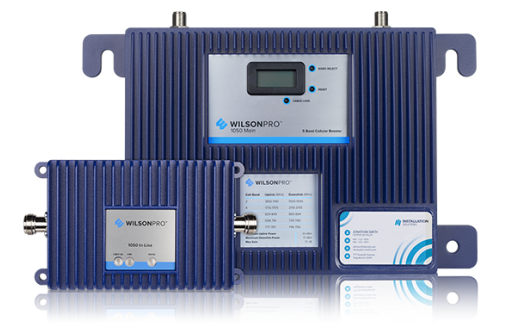 The WilsonPro 1000 amplifies weak cellular signals to provide reliable voice and data coverage - including 4G - to inside spaces where signals may not penetrate, and with new eXtended Dynamic Range (XDR) technology, the amplifier never shuts off due to a strong outside signal or changes in outside signals. Like all WilsonPro cellular amplifiers, the WilsonPro 1000 features cell site protections that auto-detect and prevent any cell tower interference. The Wilson Pro 70 Plus Select significantly improves 3G, 4G LTE cellular data for all carriers. Designed to provide maximum coverage for luxury homes, large commercial, retail or any other building needing stronger indoor cell signal. With adjustable uplink and downlink gain controls on each band with up to 70dB of gain, the Pro 70 Plus Select makes it easy to customize the cell phone booster for any specific signal environment. Learn more. Contact your local Accu-Tech representative to learn more about Wilson Electronics's solutions.